Duradek has long been a household name in Canada and has gained wide recognition in the US over the last 20 years of its over 40-year history. Now, the arrival of Duradek in New Zealand is changing the way New Zealanders look at decking thanks to Terry Hugill of PW Systems | Deck Master New Zealand. In a country where outdoor living is highly valued, New Zealanders were constantly dealing with failed tile decks. Terry knew there had to be a better method of providing an attractive surface for decks that would also provide reliable waterproof performance. With a dedication to working with only the highest quality products, Terry’s research led him to Duradek and he has been tirelessly championing the advantages of Duradek to the New Zealand building community. The following is a letter from Terry to the New Zealand building community to demonstrate the importance of teamwork and dedication to provide the best solutions for residential construction. The reason for such a letter is to share the importance of teamwork. We all need to know that great things can be accomplished if we work at it. I never dreamed this even 7 yrs ago. The journey is still going. For the past several years DeckmasterNZ and PW Systems Ltd have been pushing boundaries here in little New Zealand. Yes, we may be a small country in area, but still have the same amount of problems and issues as the rest of the world. Almost 3 years ago, we decided our part of the world had to get better in supplying quality products along with exceptional service. It is one thing to have exceptional service but if the product is not up to the same level your service means nothing. Likewise, the other way around. Prior to the arrival of Duradek in New Zealand, there was a training in the Canadian Head Office where New Zealand’s Duradek installation trainer learned the proven Duradek techniques. So, what happened? We made a call to this far away land of ice and snow (no warm weather I know of) known as Canada, to find a supplier that not only stood out but stood up. Canada is a country known for Trafficable Membranes. After searching for the best – our luck had arrived! Duradek over a very short time ticked a lot of boxes for us. Firstly, they had okay English (we could understand them on the phone). The organization functioned well on all levels (which is generally hard to find). The product range had colours and designs (we would’ve been happy with 10 but how lucky were we). Then there was quality – we’d hit the jackpot! Oh, sorry there was Kevin (from Duradek), yes, Kevin who fits into the landscape pretty well here in the golden beach sands of Orewa, Auckland. However, if the truth really be known, there is a dedicated team that makes up Duradek Canada. For us here in NZ, we now had a base to work with and not just taking material from a shelf or for that matter, off the floor and doing our best with it (no names). 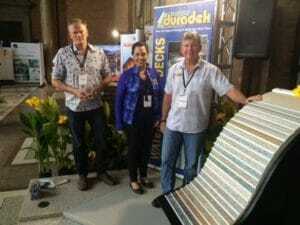 The bigger task at hand was we had to introduce Duradek to New Zealand. We soon found out it had in fact been in NZ previously although not made it far. NZ at that time was still in love with ceramic tiles and failure. We have since viewed limited historical work with Duradek and know NZ will see better days. 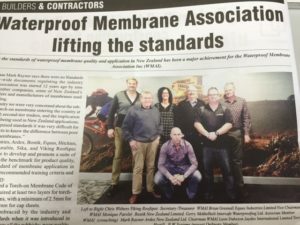 PW Sytems | Deck Master NZ’s Terry Hugill is a key member of the Waterproof Membrane Association Inc.(WMAI) in New Zealand and demands the highest quality product for reliable performance. Our next stage was to take on the big guys and claim a large space for Duradek in the PVC market. First, it was like pushing your grandmother up a steep hill in a wheelchair without letting her go. Whilst we’d had great success with other brands through our marketing, we now had to dissect things a little, review and take a strong approach. We were now not only laying product, we were importing. This meant many new things were to happen. Firstly, we needed shelving, fork hoist, secretary, and a lot of commitment. After all, there was no going backward. The material things are fairly simple, as it’s easy to simply call up the guy who sells shelving or fork hoists, put your hand into the already vanishing pile of money that once sat in your pocket and think you’ve built something. The hard items lay somewhere in the clouds and have to be gathered up and organized. This takes a team effort. Who is the team? For us the bones of the team start way before the shores of NZ. This team had already been going for 40 plus years. We had to understand the principals of this established 40yrs plus team. The New Zealand team were enthusiastic and getting focused. Once we pretty well understood this, we could then start to piece together and organize getting Duradek Trafficable membrane recognised and preferred. The only way forward was to obtain Code Mark status. This would allow designers and homeowners to specify Duradek as the membrane of choice in new builds. Without this, we were almost shoveling snow. Through many months of meetings, testing, writing, and convincing authorities, we were able to piece together our application for certification. This (Code Mark status) was granted coming up 1 year ago. So, the journey now starts with convincing NZ that they no longer need tiles on their decks and that as a company we were offering both the best in product and workmanship. Collectively they (Duradek) provide the gold medal. We are now having Duradek specified by designers. 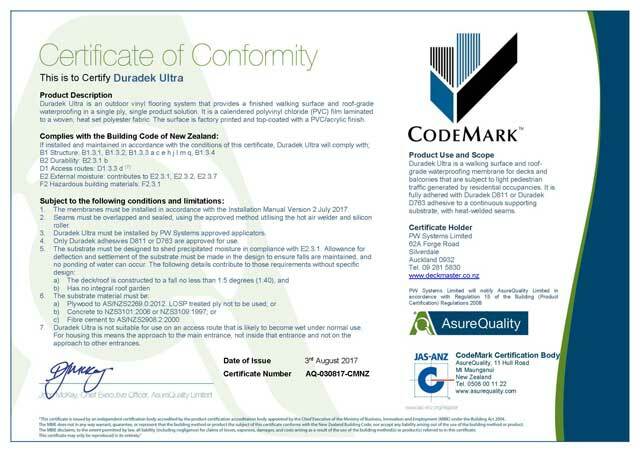 Our Code Mark for Duradek membrane specifically specifies the quality manufacture, handling, shipping, storage and application. When you are arranging delivery, packaging (kicking out the rolls to ensure perfection), providing support all before it goes on to the billing department, you all contribute to the future success of Duradek in New Zealand (Please don’t hide Gummy bears in the pallets). Every year we are audited and evaluated under the Code Mark scheme. They check our stock, compliance labels, batch numbers and level of competency in delivery of the finished product. We encourage you to continue to be part of that success story which we will continue to share.